With the advent of highly efficacious immunosuppressant drugs, the survival of patients with organ transplant has improved dramatically. Unfortunately, it has also increased the risk of developing malignancies, which increases with the increasing duration of immunosuppression. Although the risk is well known, it is imprecisely quantified. We report a case of a renal transplant patient developing squamous cell carcinoma, 20 years after renal transplantation. The purpose is to draw attention toward the need of long follow-up, active surveillance, and the measures required for early diagnosis and prompt treatment. A 45-year-old male underwent renal transplant for end-stage renal disease due to glomerulonephritis, 23 years ago, and was started on immunosuppressive drugs (cyclosporine and azathioprine). He has history of excessive sun exposure, because of his profession. The patient was alright and was on regular follow-up. Three years back, he developed itchy, irregular, papular lesions over both forearms and hands. 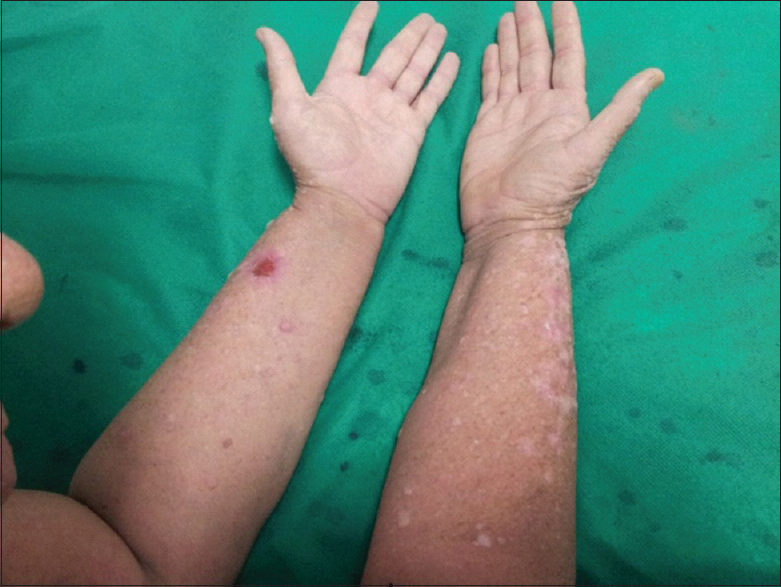 The biopsy was suggestive of actinic keratosis and was treated with chemical peeling. Lesions rapidly progressed to cover both forearms and hands, on flexor and extensor aspect [Figure 1], [Figure 2], [Figure 3]. 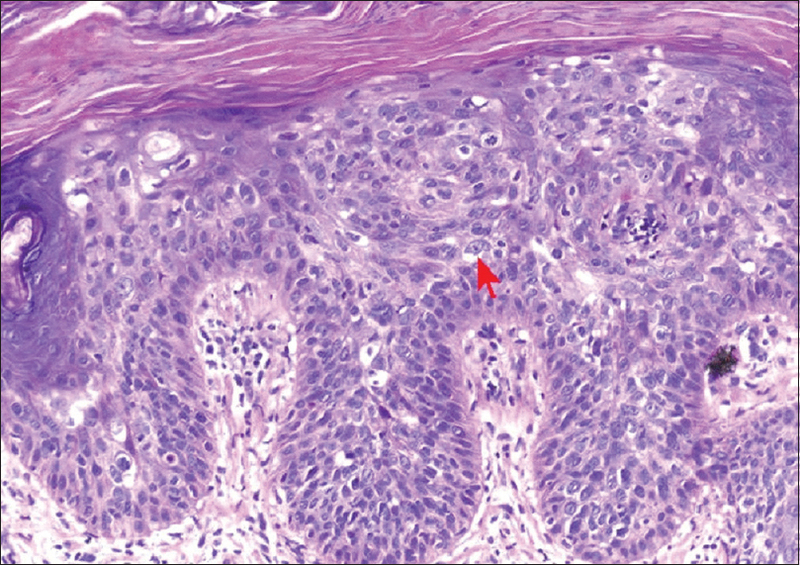 A repeat biopsy confirmed squamous cell carcinoma [Figure 4]. 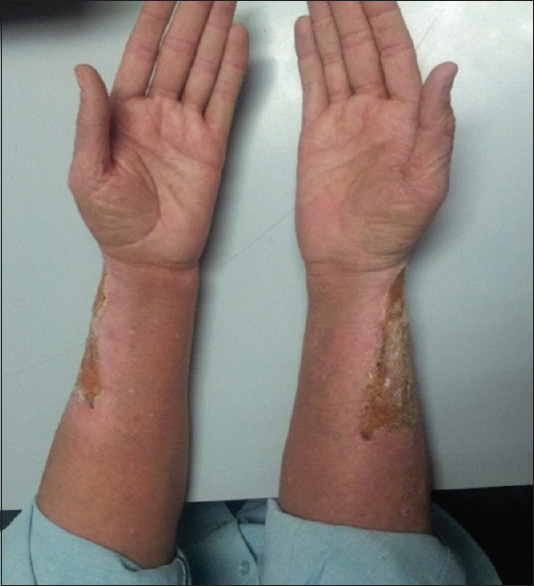 The patient was prescribed topical 5-fluorouracil but with no relief. Finally, he was referred for radiotherapy to our center. Electron beam therapy with 8 MeV electrons, with parallel opposed anteroposterior portals, was planned for a dose of 60 Gy in 30 fractions, from September 24, 2012, to November 5, 2012. The dose of immunosuppressants was reduced. 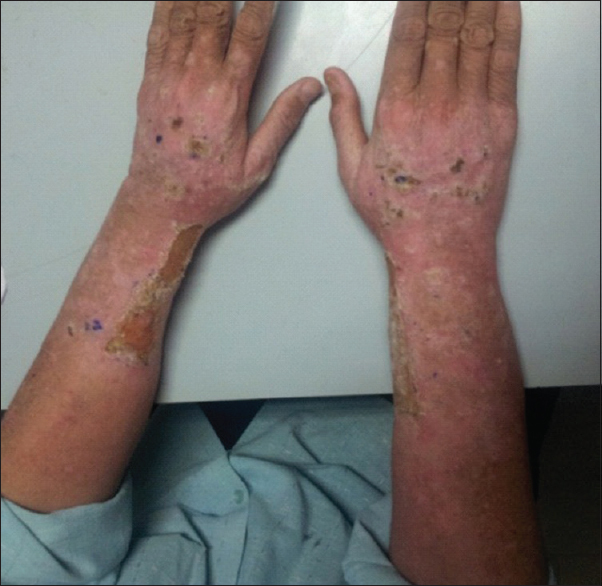 The patient tolerated the treatment well with only Grade III skin reactions. Complete response to treatment was achieved at 3 months after the electron therapy [Figure 5] and [Figure 6]. 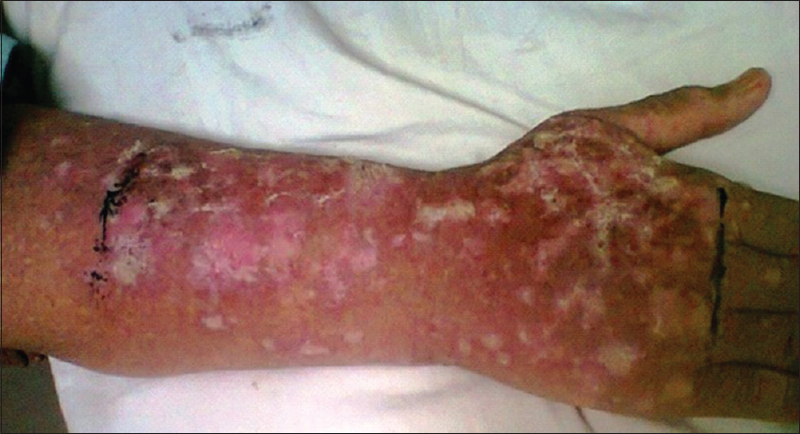 Currently, the patient is on regular follow-up and asymptomatic for the skin lesions. The graft function continues to remain stable. The Institutional Ethics Committee was informed, and due permission was taken for reporting this case as a case report. Solid-organ transplant recipients are three to five times more vulnerable to develop malignancy. The cause is attributed to the immunosuppressive treatment. These drugs impair immune reactions against viral infections, most common being human papillomavirus (HPV). In addition, inactivation of p53 gene occurs due to exposure of the skin to ultraviolet radiation which causes DNA mutations. Malignant proliferation is a result of the failure to repair such mutations. 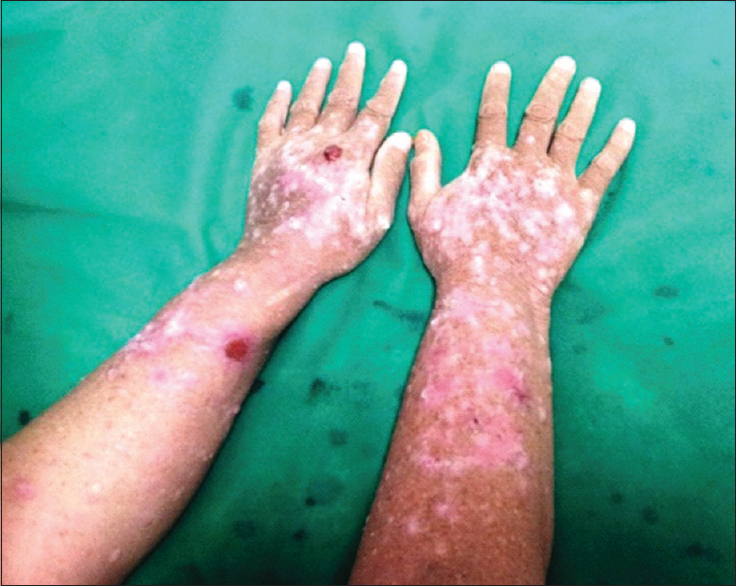 The duration and intensity of immunosuppression, sunlight exposure, and age at transplantation are powerful risk factors for the development of skin malignancy. Others are pale skin, viral infections (HPV), precancerous lesions such as warts and cigarette smoking. The most frequent types of tumors are posttransplant lymphoproliferative disorders (PTLD) and squamous cell carcinoma of lip and skin. Squamous cell carcinoma accounts for 40%–53% of all malignancies in these patients. Less frequent types are basal cell carcinoma, melanoma, Kaposi's sarcoma, and Merkel cell carcinoma. The incidence of PTLD is highest within first 3 years of transplant, whereas squamous cell carcinoma can occur as late as 20 years posttransplant. The incidence of malignancy increases gradually after 10 years of the transplant, and it becomes as high as 13.8-fold higher in these patients as compared to the normal population and the cumulative frequency increases with the increase in the duration of the follow-up. Prevention and screening may play an important role in reducing the morbidity and mortality of malignancy in these patients. Preventive measures include avoidance of sun exposure, monitoring the intensity of immunosuppressive drugs, and checking viral and fungal infections. Secondary prevention aims at early detection and prompt treatment. These patients should be examined thoroughly on a routine basis both by self and a physician to detect precancerous lesions and early cancers. Precancerous lesions could be treated with cryosurgery, chemopeeling, dermabrasion, and carbon dioxide laser. Treatment options for squamous cell carcinoma are curettage and desiccation, Mohs' micrographic technique, and cryotherapy. For extensive involvement of skin cancers, intensity of the immunosuppressive drugs should be reduced and adequate radiation therapy should be delivered. Radiation therapy is preferred in patients where the lesion is not amenable to surgery or the patient is not fit for surgery. It can also be used as an adjuvant treatment following surgery. Radiation can be delivered by 6 MV photons or electrons of the range 6–10 MeV. Electrons are preferred over photons, if available, as the dose to the skin is better with quick fall-off is surrounding and underlying tissues. Transplant recipients require long and thorough follow-up examinations. They are at high risk of developing malignancy, viral infections such as hepatitis (hepatitis B virus, hepatitis C virus), and disseminated fungal infections, for example, Candida and Aspergillus. Although the viral and fungal infections occur during the initial few years of posttransplant, malignancy can occur as long as 20 years after the transplant. Peto J. Cancer epidemiology in the last century and the next decade. Nature 2001;411:390-5. Jensen P, Hansen S, Møller B, Leivestad T, Pfeffer P, Geiran O, et al. Skin cancer in kidney and heart transplant recipients and different long-term immunosuppressive therapy regimens. J Am Acad Dermatol 1999;40:177-86. Zeier M, Hartschuh W, Wiesel M, Lehnert T, Ritz E. Malignancy after renal transplantation. Am J Kidney Dis 2002;39:E5. Chapman JR, Webster AC, Wong G. Cancer in the transplant recipient. Cold Spring Harb Perspect Med 2013;3. pii: a015677. Alam M, Ratner D. Cutaneous squamous-cell carcinoma. N Engl J Med 2001;344:975-83.